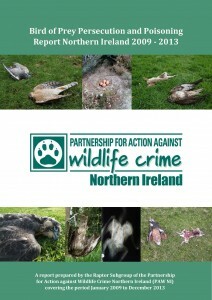 In the five years from 2009 to 2013 there were 30 illegal poisoning or persecution incidents, affecting 33 protected raptors (birds of prey), confirmed in Northern Ireland according to a report published today by the Partnership for Action against Wildlife Crime Northern Ireland (PAWNI). The most frequent casualty was the buzzard (19 birds) followed by the recently re-introduced red kite (7 birds) and then peregrine falcons (4 birds). Other raptor species that were recorded included a white-tailed eagle, a golden eagle, sparrowhawk and a merlin. There were a further 10 confirmed incidents of illegal poisoning of other wildlife or poisoned baits in circumstances where birds of prey were potential victims. 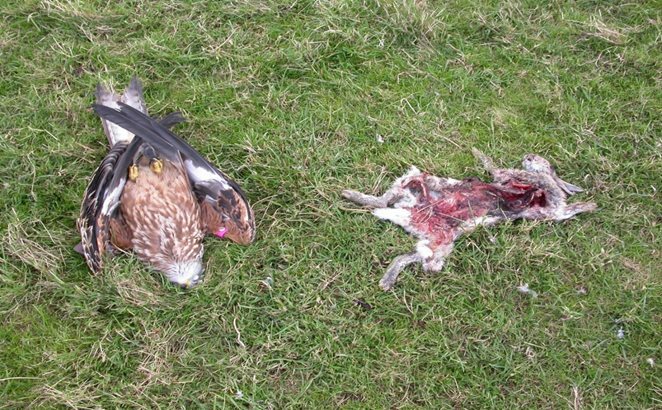 Red kites and buzzards, the most frequently recorded victims, are particularly susceptible to poisoned baits as they will feed on carrion routinely. There were an additional 4 probable raptor crimes (including another white-tailed eagle) and 8 incidents where secondary rodenticide poisoning was recorded. 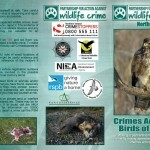 The report is the result of the work of the Raptor Subgroup of PAWNI facilitating cooperation between the Police Service of Northern Ireland (PSNI), Northern Ireland Environment Agency (NIEA), Northern Ireland Raptor Study Group (NIRSG), Royal Society for Protection of Birds (RSPB) and National Wildlife Crime Unit (NWCU) and analyses the results of post-mortem and toxicology testing carried out via Agri-Food & Biosciences Institute (AFBI) and as reported via the Wildlife Incident Investigation Scheme (WIIS). Superintendent, Brian Kee, PSNI service lead for rural and wildlife crime, said “This report highlights the continued disregard for public and wildlife safety displayed by a small number of individuals in Northern Ireland. These actions which destroy our native wildlife are illegal and the indiscriminate use of such toxic poisons may affect not only raptors but also children, pets or livestock. I would urge anyone with any information on these types of crimes to report this to the PSNI on 101 or anonymously via Crimestoppers on 0800 555 111 and be assured of PSNI continued efforts in the tackling of wildlife crime”. RSPB, NIRSG and NWCU have further welcomed the publication of the report as another step towards identifying the national frequency, timing and locations of these crimes in Northern Ireland. The publication of this report demonstrates the value of collaborative working by these organisations to help monitor and record raptor persecution in a strategic effort to identify “hot-spot” areas and help tackle the issues as well as increase public awareness and education. Raptor Persecution is one of the UK government’s top six Wildlife Crime Priorities. 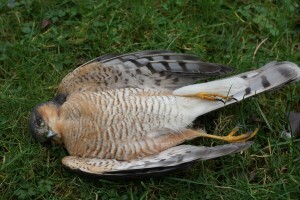 Raptor crimes typically comprise illegal shooting, trapping or poisoning events and may occur at any time of the year. It is also illegal to cause disturbance to all breeding raptors or damage their nests or eggs. The Raptor Priority Subgroup comprises Police Service of Northern Ireland (PSNI); Northern Ireland Environment Agency (NIEA); National Wildlife Crime Unit (NWCU); Northern Ireland Raptor Study Group (NIRSG) and the Royal Society for Protection of Birds (RSPB). The Raptor Priority Sub-Group is acting on behalf of and reports back to the main PAWNI group currently chaired by the Environment Minister, Mark H. Durkan. Wildlife legislation, namely the Wildlife (Northern Ireland) Order 1985 as amended by the Wildlife and Natural Environment (NI) Act 2011 protects birds of prey from disturbance and/or destruction by special penalties. Penalties can include a custodial sentence and/or up to a £5,000 fine per offence. All raptors are listed on Schedule 1 of the order and there are six raptor species which receive additional protection on Schedule A1 which protects them and their nests from disturbance or destruction at all times of the year. Schedule A1 includes peregrine falcon, red kite, barn owl, golden eagle white-tailed eagle and osprey. 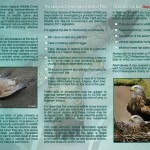 For additional enquiries please contact Dr Eimear Rooney; raptorofficerni@gmail.com; 07743068931. During the breeding season many animals defend their territories and breeding sites from potential danger and birds of prey are no exception. Birds of prey will ‘alarm call’ at any perceived threat that comes too close to their nest site. On rarer occasions they may dive at the threat if it persists, and even make contact with it. This is a natural response which can be observed by many different types of wildlife. For example, many of us are familiar with being ‘dive-bombed’ by gulls. Alarm-calling is usually enough to deter the threat, but for those of us who are not familiar with the sounds of birds of prey may not realise what is happening and continue merrily on our way, getting closer and closer to the nest. It is rare for a bird to actually make contact but it does happen and NIRSG get a few reports every year at sites where a bird is repeatedly disturbed and aggressive mobbing or ‘attacks’ may occur. We can provide information if required and ask people to stay clear of the area for a few weeks until the height of the breeding season is over. However, this year, the media have picked up on a small number of nest sites in particular where buzzards are particularly aggressive and are making contact with people who are oblivious to the early warning signs that they are approaching an active nest site. In these cases the buzzards have unfortunately nested very close to active pathways or roads and as a result are being frequently disturbed each day. The buzzard nesting season typically extends from March through to July or early August each year but young are only typically in their nests between May and late June or early July. ‘Attacks’ or mobbing behaviours may increase in ferocity throughout the season as a learned behaviour which you get with any bird – if it makes contact and it is successful in making the threat leave then it learns to perhaps do this quicker and harder next time so the threat will leave quicker. The more birds are disturbed the more aggressive they may become, and this goes for most nesting birds, including gulls, terns and waders. Every individual bird may be totally different in their response to disturbance and the majority will perhaps alarm call and then fly high overhead calling continuously and it is important for people to try and understand what these behaviours and calls might mean and minimise such negative impacts on our wildlife. Birds of prey in Northern Ireland are protected under the Wildlife (Northern Ireland) Order 1985, as amended by the Wildlife & Natural Environment Act (NI) 2011 and it is illegal to disturb them at, in, on or near their nests. Such offences may be subject to a custodial sentence and/or £5,000 fine per offence. There is a reason for this. Birds of prey sit at the top of their food chain and thus are very sensitive to changes in the environment. This leaves them as very vulnerable species whose populations are unstable. The success of their breeding attempts can be affected by disturbance, with eggs and chicks at risk from chilling, predation and starvation when the adults are responding to perceived threats. One or two successive poor breeding years is enough to cause radical declines in some species. If you are aware of a bird of prey calling when you are out an about, take a few seconds to think, am I disturbing this bird and could it be calling at me? If so, please find an alternative route for the next number of weeks. We would therefore advocate avoidance as the means to prevent such disturbance to the buzzards and their nests and thereby also avoid any associated mobbing and defensive behaviours. Buzzard chicks are generally large enough to be left alone by the adults by mid-late June and they leave the nest around the first week of July. Over this time the defensive behaviour of the adults will decrease and the mobbing behaviour will not then typically occur. These birds are only protecting their young. You can let NIRSG know whereabouts you are witnessing this protective behaviour and we can take action by putting up signage asking people to find an alternative route until the end of the breeding season (email: info@nirsg.com or raptorofficerni@gmail.com). Finally, if you witness any bird of prey being antagonised or disturbed you can call PSNI on ‘101’ or anonymously at Crimestoppers ‘0800 555 111’. This disturbance may, after all, be a crime, and should be reported. 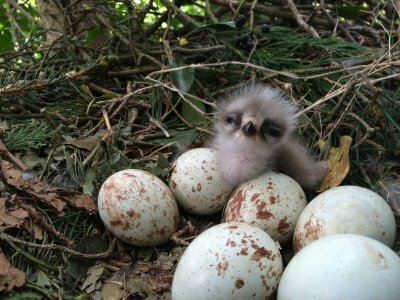 Buzzard Cam Launched in Co. Down – interactive monitoring of buzzard nests by Northern Ireland Raptor Study Group at National Trust property Mount Stewart, on the Ards Peninsula. 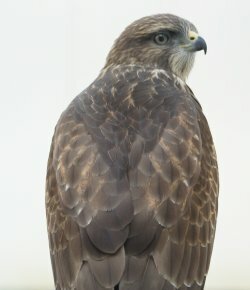 The Northern Ireland Raptor Study Group (NIRSG) in collaboration with the National Trust has this year embarked on an initiative to remotely monitor activity at buzzard nests and facilitate a unique raptor interactive experience with the wider public. Teams of raptor study group volunteers have been closely monitoring all raptors across Northern Ireland but two special buzzard nests on Mount Stewart estate on the Ards peninsula have been getting close attention over recent weeks, one of which contained three eggs and the second contained an exceptional six eggs and one recently hatched chick, meaning that seven eggs were laid. These two buzzard nests are currently being monitored for research purposes by remote cameras, under special licences and permits from the Northern Ireland Environment Agency (NIEA) and Forest Service NI, at the stunning National Trust property at Mount Stewart, Co. Down. Footage from one of these nests which had the three eggs is being streamed to the wider public via the NIRSG web-page (www.nirsg.com) and footage is also being relayed to TV screens at Mount Stewart where people can also watch the progress of the nest over the summer. Dr Marc Ruddock, Project Manager for the NIRSG said; “We were hugely grateful to have received funding from the Challenge Fund in 2015 to visit schools across Northern Ireland and also to build this remote monitoring camera system. This system took many months to build and we now have a remotely powered camera recording high quality footage of the buzzard nests in Mount Stewart. Dr Ruddock continued “We would like to thank Andrew Murray and Stuart Ogg, the experts behind the construction of the system and also the National Trust for hosting the camera and our Raptor Officer for working to locate these nests. Dr Ruddock concluded this team project provides a fantastic blend of wildlife knowledge, raptor understanding, technology, field survey effort and with the essential support of land managers to provide a truly unique interactive experience for our raptor workers and also the public”. Mr Andrew Upton, Coast and Countryside Manager for National Trust for Strangford Lough & the Ards Peninsula said “We are delighted to have been able to host this type of project at one of our properties and we will have footage from the camera system relayed to screens at Mount Stewart to allow our visitors to see what happens first hand in the buzzard nest and we look forward to people coming to see this species on the estate in such a novel and interactive way whilst causing no disturbance to these special birds”. Dr Eimear Rooney, the NIRSG Raptor Officer, who completed her PhD on buzzards in Northern Ireland said “I am excited to be able to get a 24/7 insight into the life of a buzzard family. 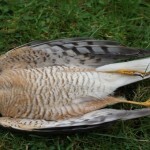 This is a species which is far too often killed illegally in Northern Ireland, particularly by poisoning, and this type of research and engagement with people is really important for us all to understand the value of raptors (birds of prey) and their behaviour and lifestyles within our eco-system”. Dr Rooney continued “Our volunteers work tirelessly in monitoring many birds of prey across Northern Ireland and we wouldn’t find interesting nests such as this without the hard work of the volunteers. If anyone would like to help you can report your raptor sightings at the NIRSG webpage or why not follow us via Facebook to get updates about our work and in particular to receive updates of these nests”. Carol Forster from Northern Ireland Environment Link (NIEL) which administered the Challenge Fund monies for the camera and education projects to the NIRSG said “It’s really wonderful to see Challenge Fund money used for such a positive project delivering clear multiple benefits – benefits for wildlife, benefits for society in getting volunteers involved in nature, and benefits for government in terms of monitoring and data gathering”. Cathy Smyth ornithologist at Northern Ireland Environment Agency said “NIEA is delighted to work closely with the NIRSG and this interactive project, giving visitors a chance to get up close to a buzzard nest and affording them the opportunity to develop an interest in these fantastic birds”. 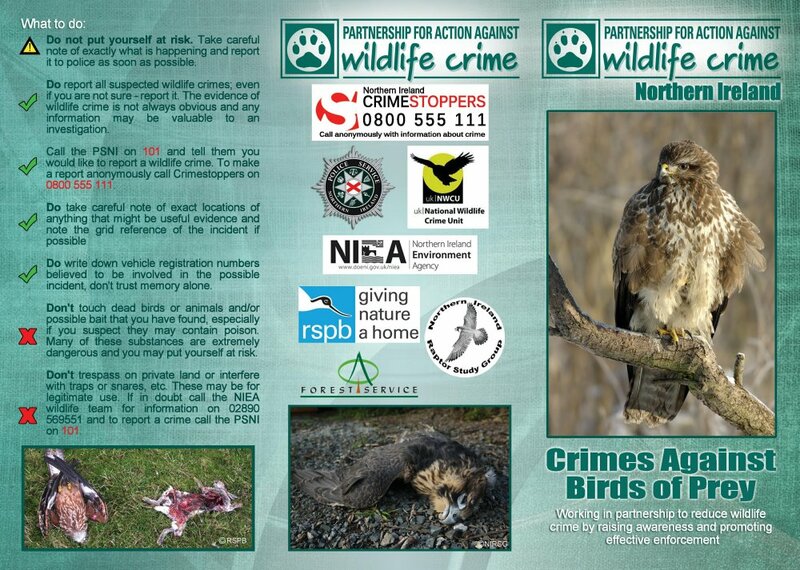 On the 8th March, at the annual Northern Ireland Raptor Study Group conference at Oxford Island Nature Reserve a new bird of prey (raptor) leaflet was launched by the Partnership for Action Against Wildlife Crime (PAW) Northern Ireland encouraging members of the public to record and report suspected cases of raptor crime directly to the Police Service of Northern Ireland (PSNI). In living memory during the 1960s, Northern Ireland lost our last breeding golden eagles, at Fairhead in Co. Antrim. It is believed persecution, habitat loss, negative human attitudes and disturbance all played a key part in the loss of some of our breeding raptor species over the past 200 years. Amongst others we lost breeding golden eagles, white-tailed eagles, ospreys and red kites whilst buzzards were almost totally extinct. Over time some of these species have recovered naturally or via re-introduction programmes and are hailed as conservation successes. However, each year illegal incidents of shooting or poisoning are recorded and undoubtedly the incidents detected may only be the tip of the iceberg. Dr Eimear Rooney, recently appointed as Raptor Officer, with NIRSG, stated: “Disappointingly our volunteers detect incidents of raptor crime each year, particularly of peregrines falcons and buzzards being poisoned or shot. Some of our rarer species, such as the hen harrier, are still threatened by habitat destruction with several known nest sites having been burnt out during uncontrolled heather fires in recent years. It is important that our volunteers and the wider public learn how to detect and report raptor crimes so we can minimise the effects of illegal activities on their populations”. 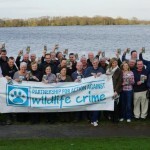 Dr Jon Lees, NIEA Wildlife Officer said, “PAW NI aims to increase public awareness of crimes against our wildlife, to increase reporting of suspected wildlife crimes to the PSNI and to deter offenders in the first place. The loss of primary predators such as birds of prey from our ecosystems has serious consequences for Northern Ireland’s ecosystem, which ultimately impact a wide range of species. The barbaric and cruel methods used by the offenders to trap, poison or kill these birds would offend the majority of Northern Ireland’s citizens and these criminals can often put human lives at risk by indiscriminate use of highly toxic chemicals. The PAW NI appeal to the wider public to report these types of crimes, as they would any other crime, to help the PSNI tackle these issues. 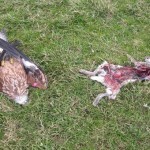 Raptor crime, or indeed any wildlife crime, simply should not be tolerated”. Wildlife Officer for the Police Service of Northern Ireland, Emma Meredith said: “Wildlife crime incidents, particularly where they occur in remote locations, can often go unreported. I hope the information leaflet will continue to encourage members of the public to provide valuable information to the police, and help us continue to build a more accurate picture of the extent of raptor crime on our native birds in a tangible way”. Emma, continued; “It does not matter how small each piece of information that members of the public have, it could help the PSNI protect our raptor species. I would urge people to pass this information either directly to Police on 101 or anonymously to Crimestoppers on 0800 555 111”. 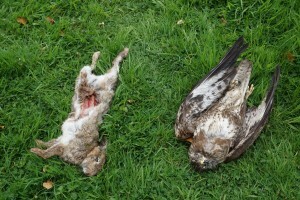 Often raptors in Northern Ireland are poisoned by highly toxic, illegally used substances such as carbofuran or alphachloralose, which are laid out on meat baits, such as dead rabbits or even sausages, in the open countryside. These baits are typically left uncovered and can easily be discovered not only by wildlife but also children or be eaten by pet dogs or cats with fatal consequences. Numerous incidents of pets being poisoned are also recorded every year in Northern Ireland. These types of activities should not be tolerated and present a serious risk to human health and the perpetrators simply do not seem to have a conscience in this regard. 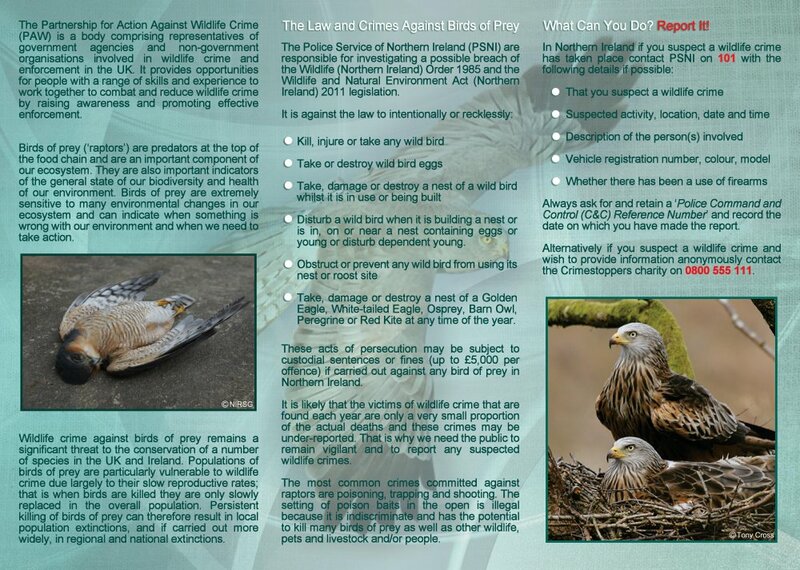 This leaflet is aimed to disseminate information, and particularly improve awareness, detection and reporting of raptor crime throughout Northern Ireland. Crime prevention through education and awareness raising plays a vital role in reducing criminality and anyone with information on raptor crimes are urged to contact their local PSNI.